Do you like to play a brawler to the tune of heavy metal? Well, Coffee Crisis may have you covered with its homage to 90’s era 16-bit and classic arcade brawlers. Now out on the Nintendo Switch, this outlandish title is a great pick-up-and-play experience, but does it have the gameplay and mindless fun-factor the genre is known for? Coffee Crisis, from developer Mega Cat Studios and published by Qubic Games, is a beat ‘em up where you play as a barista defending earth against an alien invasion. The story is absolutely bonkers with an alien race called the Smurglian’s not leaving earth without taking the best metal music and coffee from the planet. What’s even more fascinating is that this was actually a title built for the Sega Genesis. Not originally for the console, but instead the developers released Coffee Crisis so it could play on a Genesis console today. The best part about Coffee Crisis is how old school it feels. It’s like reliving the experience from your childhood, only with a modern sheen. This includes all the good and bad that goes along with these types of games. Making a game for the Sega Genesis with today’s audience in mind will bring over many limitations from that era and the same applies to Coffee Crisis. 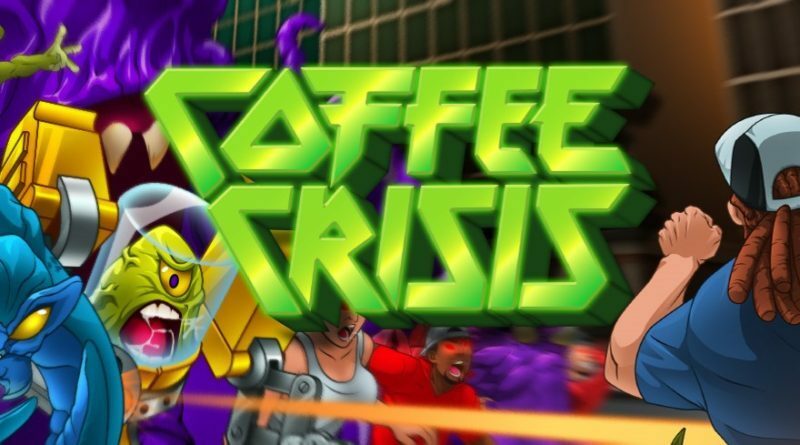 If you’re a fan of punishing old-school brawlers that are still fun to play, Coffee Crisis feels and plays just like those. Just be prepared for all the annoyances that come with a game from that genre. Gameplay-wise, Coffee Crisis is a very basic brawler sharing many similarities to games from the early 90’s. There is non-stop combat and you need to keep moving, because if you stand in one place for too long you’ll get wrecked. The enemies swarm around you and have no problems laying a barrage of punches all around you. A tip for getting out of harm’s way while attacking is to use the jump kick, and I found this most effective. Unfortunately, I didn’t care for the layout of how you attack, as the main attack buttons are mapped to the ZR and R bumper, which felt less intuitive than just pushing a face button. Enemies will spawn from either side of the screen and it’s best to get them grouped up, because you can stagger them with your hits. There are some power-ups you can collect throughout a level, but it’s nothing too unique. Coffee Crisis has your standard health pickups and invincibility drops, as well as getting various point boost power-ups to help increase your score from combos. You can charge up your main attack to perform a stronger hit, but most of the time it’s harder to pull off. Co-op is probably the best way to experience Coffee Crisis as it’s perfect for reliving the glory days of hanging out with your friends playing a mindless beat ‘em up. I wish they would have added the ability to play with four-players, but it’s only slight omission. There could have been a better explanation of the differences between the two characters you can control. Ashley may be faster, but really it’s hard to tell and adding some stat bars like Streets of Rage would have been a nice touch. Finally, I’d be remiss not to mention the outstanding metal soundtrack accompanying the action. It’s riveting and goes perfectly with the art aesthetic to provide an adrenaline-filled experience. Retro graphics can be overused, especially on the Switch, but Coffee Crisis looks great and has beautiful animations. I was also pleasantly surprised to see video game collector sensation: Metal Jesus Rocks as a boss-like character having been controlled by the aliens. Rock on! Overall, Coffee Crisis is a classic beat ‘em up experience for better or worse. The retro art style is solid and the music is absolutely fantastic and the best part of the title. The developers wanted to recreate an old-school style game and I would have to say they accomplished that. You almost need to be a fan of those types of games for this to be a recommended purchase. If you are though, prepare for a killer experience.